Team captains for Portsmouth and Rock Hill meet prior to the game’s commencement on Tuesday evening. Portsmouth defeated Rock Hill, 55-37. Portsmouth’s Gabe Gambill passes the ball to a teammate in warmups. From time to time, you might hear athletes utter the phrase “no days off” when talking about their lifestyle. Sometimes, those three words are literal. Other times, the adage is spoken but not put into action. In terms of OVC boys basketball, that statement reigns supreme. There are no days off when it comes to the conference slate of games. Such was the case on Tuesday night when the Portsmouth Trojans knocked off the Rock Hill Redmen, 55-37. Portsmouth head coach Gene Collins knew Rock Hill would present a challenge to his team, despite the Redmen entering the contest with a 1-16 overall record. After all, the Trojans had played Rock Hill just three days before on February 3. Portsmouth would win the contest 54-42, but the game was much closer than it appeared by glancing at the numbers. One such area that brought concern to Collins was rebounding, a facet of the game that the Redmen excel at with their post players. Led by 6-foot-4 senior Jaret Bacorn and 6-foot-3 junior Kadin France, Rock Hill brings a formidable duo to the table with the play down low of the two. In the rematch, that was on display in several columns. France scored 12 points Tuesday night, and Bacorn had 10. The two also played a huge part in the Redmen outrebounding the Trojans 37-27 in the contest. Rock Hill specifically was able to cash in on the offensive end, where they were able to get as many as four shots on multiple possessions. At times, though, the Redmen struggled to make those second chance shots which was a part of the game that wound up being costly. In addition to those woes, Rock Hill coughed the ball up 25 times to the Trojans. Those turnovers allowed Portsmouth to have easy transition points that helped stretch the margin of the score. The Trojans constantly changed up their looks on defense, disrupting the flow of Rock Hill’s offense throughout the night. Portsmouth started the game with two straight scores from senior Reese Johnson, who blew by his defender twice for easy finishes at the rim. Johnson posted a game-high 16 points. The Redmen took a 6-4 lead with 5:23 to play in the first quarter, but would be playing catch up the remainder of the evening. Tying the score at nine using two Bacorn free throws with 3:50 remaining in the opening period, Rock Hill would have to try and rally as the Trojans burst ahead with a 15-0 run. That streak extended well into the second quarter, but after one it was Portsmouth on top 14-9. Johnson hit the final shot of that run with a triple with around three and a half minutes before the second quarter ended. On the opposite end of the court, the Redmen were struggling to score. Rock Hill would go over eight minutes with a point, until Bacorn hit a shot with 3:05 left in the period. Despite the shooting issues, the Redmen were still sticking around at halftime. The Trojans led 31-17 through two. Portsmouth played with a sense of urgency to start off the game, but weren’t able to cash in as much as their head coach would have liked. Both teams had their fair share of struggles in the third quarter, as each school combined for just 10 points. After three, the Trojans were still in control, 37-21. Portsmouth had a lot of problems with turnovers in the third, and throughout the night. The Trojans would give the ball away 16 times during the game, a topic that didn’t go unnoticed to Collins. 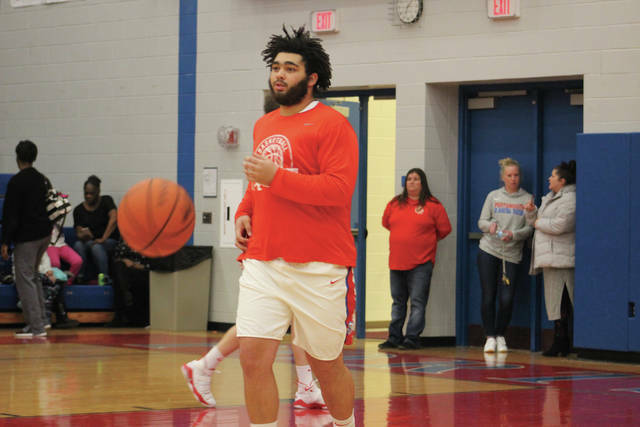 In the quarter, Portsmouth got scores from Daniel Jordan, Isaac Kelly, and Danny Lattimore. Jordan posted 12 points during the course of the contest, up to his usual relentlessness on offense. Kelly had eight, and Lattimore scored four points. Kelly played some point guard for the Trojans at times during the game, running the show well for Portsmouth at the position. The final quarter saw both teams wake up on offense, and Rock Hill continued to battle in the last eight minutes. Scores from Cody Roberts and Isaac Floyd cut the deficit to 42-27 with 5:54 to play, but by that time the Trojans were just too far ahead. Afterwards, back-to-back threes found nylon from the hands of Matthew Fraulini following the two baskets from the Redmen to put the game out of reach. Fraulini had 11 points in the game, and Portsmouth knocked down six triples on the night. In contrast, Rock Hill was 0-for-7 shooting the three ball, which ultimately led to a 55-37 Portsmouth victory. 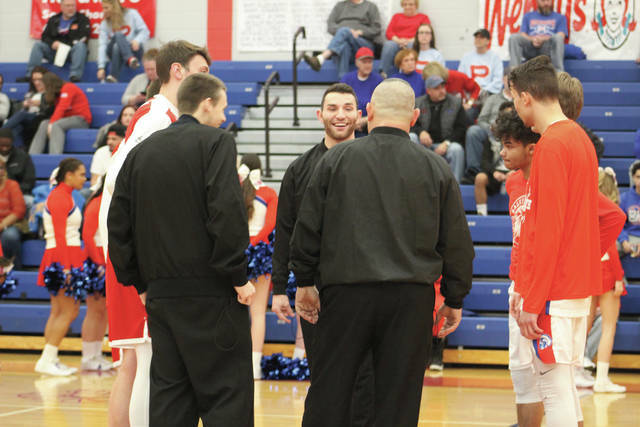 Portsmouth (12-6, 7-5) has a tough battle looming on Friday against Gallia Academy, a matchup that Collins said will really challenge the Trojans if they don’t clean up some phases of their game.